Keeping Ants Out: Your Seaside Heights Ant Control Guide. There are more than 700 species of ants in the United States, and over 20 of them are regularly nuisances in homes. With so many ants crawling around, it’s no wonder that ants are the number one nuisance pest in the country! 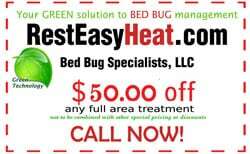 Rest Easy Heat, a top-rated Seaside Heights ant control company, wants to help homeowners protect themselves. To discourage ants from coming into your home, eliminate food sources that could attract them. Sweep your kitchen floor, wipe the counters regularly, and ensure your garbage can has a lid. Store foods in pest-proof containers or in your fridge. Avoid leaving dirty dishes in your sink and clean your kitchen sink frequently. You should also seal any cracks or crevices that ants could use to enter your home. This could include the gaps under doors or cracks in the foundation. Existing ant infestations can be controlled by locating and destroying the colony — but this is easier said than done. Each ant species has different nesting habits and responds to different types of baits, so you must correctly identify the ant species before you can effectively treat the colony. Preventing and controlling ant problems can be very difficult. 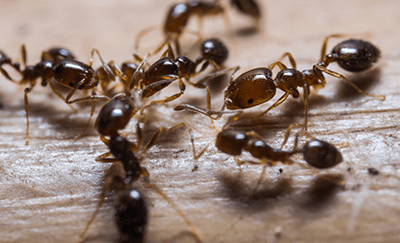 For help protecting your home from ants, trust the Seaside Heights ant control experts at Rest Easy Heat. At up to 0.5 inches long, carpenter ants are among the largest ants in the country. In New Jersey, black carpenter ants are the most common variety. They nest in wood and use their jaws to hollow out tunnels and galleries, and over time, they can cause significant damage to wood. Thanks to these strong jaws, they can also give people a painful bite. Pavement ants are small at around 1/8 inch long. Their coloring can range from light brown to black. Usually, pavement ants nest outdoors, and can be found living underneath sidewalks, patios, and driveways. They often enter homes to look for food and can become serious nuisances in kitchens. These ants get their name from their jet-black coloring and very small size. They’re only 1/16 inch long. Since these ants eat meats, fruits, vegetables, sweets, and grease, they’re frequent visitors to kitchens. Wall voids, woodwork, piles of lumber, and rotting logs are common nesting sites for these pests. Thief ants are yellow to bronze in color, and they’re very small at only 1/32 to 1/20 inch long. They make their nests in the soil or in wood, and may venture inside homes to search for food. They love eating meat, cheese, oil, and other greasy foods, and can become a major nuisance if they move into your kitchen.